I don’t know about you, but when I think of going to the British seaside I think of Mr Whippy ice creams. With a flake and some strawberry sauce of course. So this British Seaside Cake embodies my vision of it perfectly. 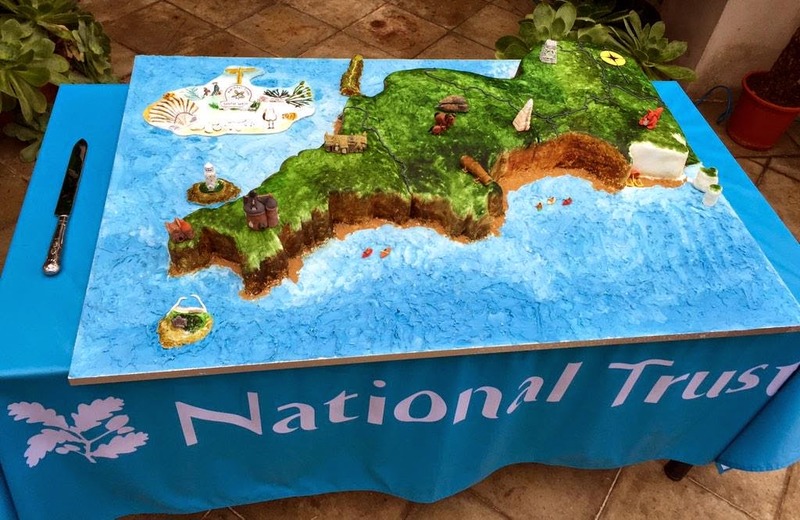 The National Trust are celebrating the South West Coast at the moment with a Coastal Festival, and seen as they look after over 300 miles of it, there’s a lot of fun to be had! They’re arranging everything from beach clean ups, water sport events, walks, runs, picnics and plays. They’ve even made the epic cake above to commemorate their celebrations, and have asked bloggers to make cakes too, with the theme ‘I love the coast’. My British Seaside Cake is all about my childhood memories of going to the seaside, playing in the sand and eating ice cream. My cake was three layers high and I baked each layer separately. I started by greasing and lining my tins. Then I creamed together butter and caster sugar. I added in eggs, bit by bit, and vanilla extract, and whisked well. Finally I folded in self raising flour and baking powder and divided the mixture between the three tins. I measured the mixture to make sure it was divided evenly. I have a lot of problems with my cakes getting domed tops and I read some tips about making a hole in the middle of the mixture to stop this, so I thought I’d give it a try. The second part of the anti-dome tip was to place a circle of greaseproof paper over the top with a hole in the middle. I baked the cakes on 160C/325F/Gas Mark 3 for 30 minutes. Well the tips worked! My cakes came out perfectly flat on top. I am going to definitely use these tips next time. I left the cakes to cool. For the ‘ice creams’ on top of the cake I purchased some cup cones, the ones with flat bottoms. I wrapped them in foil and placed them into a muffin tin. Then I made a cake batter using the same method as the bigger cake. They baked for 25 minute. I removed the foil and left them to cool. For the icing I mixed together icing sugar with butter and vanilla extract. I piped it onto the cones just like a Mr Whippy, and then pushed in a chocolate flake. I made the blue sea icing by mixing together icing sugar, butter, blue food colouring and vanilla extract. For the sand I crushed up digestive biscuits. 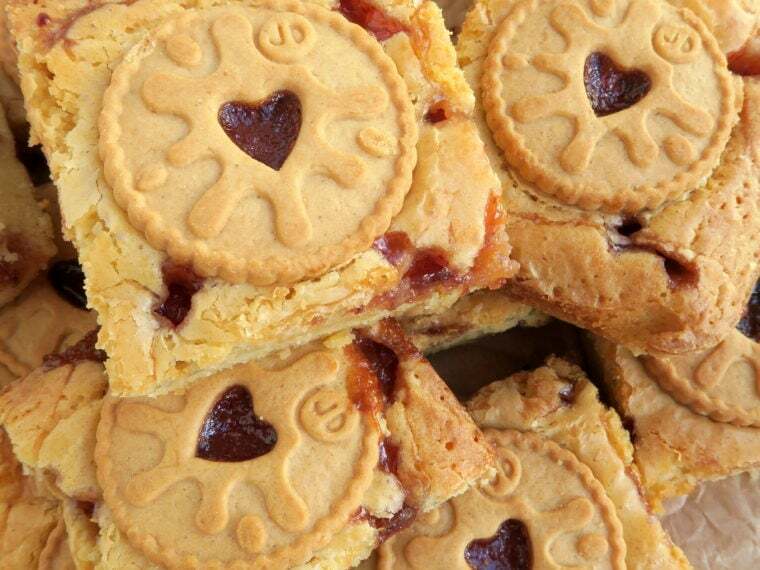 I layered up the cake using strawberry jam to sandwich them together. Then I iced the cake all over with the blue buttercream, I put 2 cocktail sticks into the bottom of each ice cream cake and stuck them into the cake. This gave them stability as the flake made their weight uneven. I then piled the biscuit sand all around the cones and all over the top of the cake. The final flourishes were shell chocolates around the edge of the British Seaside Cake and some strawberry sauce on the ice creams. I was so pleased with the final result! It was like the seaside had come to my house. It was delicious inside too, I think the simple flavours of vanilla and strawberry jam were just right for the indulgence of the decoration. My boyfriend loved the ice cream cone cupcakes in particular, and I thought they were really tasty too. Cream together the butter and caster sugar until smooth. Thanks Laura! I'm feeling all summery now! This is so fun Kat – captures the essence of British seaside holidays! Now I want a 99! !